Flashback ... Project Qatar 2014. In its 12th year, Project Qatar has positioned itself as the region’s one-stop shop for the construction industry, and has garnered support from the public and private sectors alike. Now in its 12th year, Project Qatar 2015 returns this year with exhibitors from more than 30 countries and 19 national pavilions showcasing the latest products and expertise available on a global level. The event, which will be held in Doha next month (May 4 to 7), has also received an unparalleled level of support from a wide range of sponsors and authorities, comprising private and public sector entities alike. 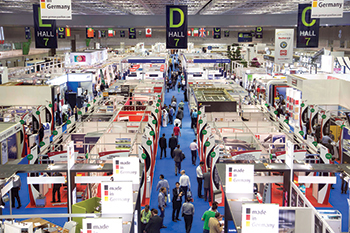 Scheduled to unfold at the Qatar National Convention Centre (QNCC), the international construction technology and building materials exhibition will once again gather thousands of professional visitors, industry buyers and decision makers, offering them an integral venue to engage with leading exhibitors from around the globe, enabling them to expand their business further, according to IFP Qatar, the organiser. Another major addition complementing the development of its exhibit portfolio, he says, is the expansion of the ‘Project Qatar Business Intelligence Series’. “As education remains a priority, the PQ team will introduce over six specialised conferences. Visitors will have the opportunity to learn through special seminars and short courses, unlocking new possibilities,” he adds. Over the past years, the presence of international attendees at Project Qatar has increased continuously. Well ahead of the 2015 exhibition, 19 pavilions are already confirmed to be present this year, representing countries such as Austria, China, Cyprus, the Czech Republic, Egypt, France, Germany, India, Iran, Italy, Jordan, Saudi Arabia, Kuwait, Malaysia, Pakistan, Portugal, Turkey, the UAE and the UK. This year, Cyprus will, for the first time, be hosting a pavilion of its own, showcasing its many products and services. At least, 34 previously participating countries will, moreover, return to this year’s exhibition, including, among others, Belgium, China, Denmark, Greece, Hong Kong, Jordan, South Korea, Lebanon, Oman, Poland, Romania, Serbia, Singapore, Spain, the Netherlands, Ukraine and the US. The Italian delegation is among the longest-standing attendees of Project Qatar, given its ongoing interest in and contributions to Qatar’s vibrant business landscape. Nearly 50,000 people visited the show last year. This year, Italian Trade Agency (ITA) will host 56 companies and associations under its umbrella. “Both the expansion and international appeal of Project Qatar are testaments to the exhibition’s significance for Qatar’s rapidly evolving construction industry. The generous contributions from local, regional and international supporting bodies speaks equally of Project Qatar’s vitality,” says a spokesman for the organiser. As in the past, the Qatar Chamber of Commerce, which is committed to providing unique services to the Qatari private sector, remains among the exhibition’s critical partners. This year, it is joined in organising pavilions by the China Council for the Promotion of International Trade, Dubai Exports, Egypt Expo and Convention Authority, Enterprise Greece, the German Federal Ministry of Economic Cooperation and Development, Gulf Organisation for Industrial Consulting, ITA, Korea Trade Investment Promotion Agency, the Saudi Export Development Authority (Seda), Trade Development Authority of Pakistan, Trade Promotion Organisation of Iran, UbiFrance, UK Trade and Investment and other organisations. “We are pleased to support Project Qatar this year. Being the voice of the private sector, Qatar Chamber plays an important role in seeking and developing successful opportunities for all business sectors in Qatar, more importantly the SME sector. We believe that Project Qatar exhibition, with its solid and successful global reputation, is highly contributing to this objective,” says Remy Rowhani, CEO of the Qatar Chamber of Commerce and Industry. Firas bin Abdul Aziz Aba Al Khail, marketing and corporate communications director of Seda, confirms that the authority’s participation in Project Qatar highlights the importance of the GCC market for Saudi building and construction products. 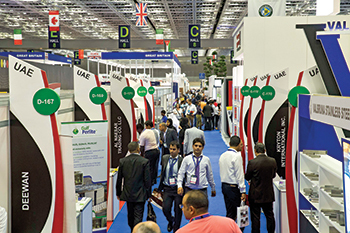 This year, Project Qatar has expanded its portfolio, providing thousands of professional visitors, industry buyers and decision makers from around the world with the opportunity to network with leading manufacturers and suppliers in a variety of sectors. These include construction and building materials; industrial and commercial cleaning; lighting; metal manufacturing; heating, ventilation and air-conditioning; aluminium manufacturing and processing; power; glass and glazing products and technologies; heavy machinery; facilities management; stone; concrete and masonry products; woodwork; mechanical, electrical and plumbing; and waste management and recycling. As in previous years, a couple of events, namely the Qatar StoneTech 2015, the fourth international stone and stone technology show, and Heavy Max 2015, the 12th international exhibition for heavy machinery, will be held concurrently with the exhibition at the QNCC. “While the former responds to steadily increasing demand for building materials worldwide – given the estimated infrastructure investments worth $200 billion over the next decade in Qatar alone – the latter reflects the $37-million surge in demand for heavy equipment and machinery alike by 2015,” says the spokesman. Since its inception in 2004, Project Qatar has developed remarkably; last year, it hosted an astounding 2,100 companies and 48,953 visitors from 47 countries at the state-of-the-art QNCC, compared to just over 322 companies from 22 countries in its founding year. Within a decade, Project Qatar has established itself as a highly sought-after exhibition in Qatar, the region and worldwide. With 87 per cent of the remaining work on Qatar’s top 20 infrastructure projects yet to be awarded, Project Qatar and the exhibitions and conferences held concurrently and throughout the year, are going to further increase their value to industry stakeholders in and beyond Qatar, the spokesman says.